Paul Atkins, former Commissioner with the Securities Exchange Commission, Joseph Brady, Executive Director of the North American Securities Administrators Association, Chris Brummer, Georgetown University Law Center Professor, and Sarah Hanks, CEO of CrowdCheck, participated in a discussion moderated by J.W. 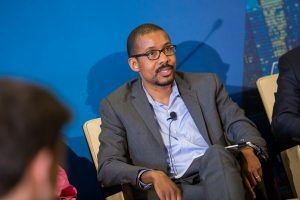 Verret, Senior Affiliated Scholar with the Mercatus Center, aimed at laying out the current state of play in cryptocurrencies. 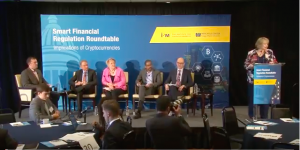 Former Commissioner Atkins started the conversation by providing a framework to think about when a coin or token might be considered a securities and when it makes more sense to think about it as a utility before the panel covered different uses for cryptocurrency coins and the challenges potential users face given regulatory uncertainties. That problem can be magnified, according to Hanks, by potential businesses expressing eagerness to use blockchain technology without having fully thought through what they actually want to use to technology to do. Professor Brummer also noted the “trilemma of innovation,” arguing that when trying to create clear rules, achieve market integrity, and foster financial innovation, policymakers can usually only manage two out of the three. Executive Director Brady discussed enforcement issues, emphasizing that NASAA is concerned about “significant fraud” in the cryptocurrency and ICO space. Brady highlighted Texas in particular, and their use of social media to identify and pursue fraud investigations. Gary DeWaal, Special Counsel with Katten Muchin Rosenmann LLP, moderated the second panel featuring Jerry Brito, Executive Director of Coin Center, Ryne Miller, Associate with Sullivan & Cromwell, Brian Trackman, Fintech and Innovation Counsel with the Commodity Futures Trading Commission (CFTC), and Angela Walch, Associate Professor at St. Mary’s University School of Law. 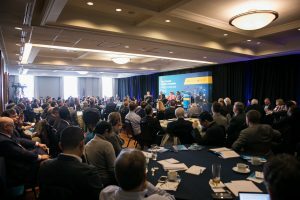 Beginning the conversation, DeWaal broke down the basics of cryptocurrencies, likening the underlying technology to email, Excel, and the buying and trading of stocks before turning to the panel. Brito added the importance of Bitcoin’s peer-to-peer connection, eliminating the need for a third party intermediary, and the value of creating verifiable transactions by overcoming the lack of inherent scarcity for digital goods. Miller pointed to the SEC’s no-action letters stating that baseball teams selling the right to purchase season tickets (not the tickets themselves) were not engaged in securities trading. He noted that while this precedent hasn’t necessarily been a focal point for recent regulatory conversations regarding cryptocurrencies, it may in the future. Walch called for regulatory clarity and predictability, citing regulators’ efforts to “take action at the right time,” in order to protect consumers and avoid stifling innovation. She pointed to the initiative state policymakers are taking as evidence that the time for regulatory clarity has arrived. Walch also noted that many assumptions, including those made by policymakers, about cryptocurrencies might be wrong. Specifically, she pointed out that concentration in cryptocurrency “mining” makes some public blockchain systems less decentralized and more susceptible to collusion than is commonly believed. Trackman observed his lack of surprise that different regulators were exploring their role in cryptocurrency policymaking. He argued that the cryptocurrency market is still new, and cited Pets.com as an example from the early days of the internet, when companies who seemed to dominate the landscape one year could disappear the next. Brian Knight, Director of the Mercatus Center’s Program on Financial Regulation, sat down with CFTC Commissioner Behnam to discuss the Commission’s approach to cryptocurrency. Commissioner Behnam emphasized that the definition of “commodity” was broad, and that nearly any “contract on future delivery” falls under the CFTC’s jurisdiction. Behnam argued that regulators should first parse out existing authority, and then hope for additional statutory language from Congress where appropriate.